Usually we travel just a bit at a time, savoring each place as we go, and covering as little distance between stops as possible. This week, however, I jumped on an airplane in Florida bound for Boston, Massachusetts, to meet up with friends and family for a very brief visit. 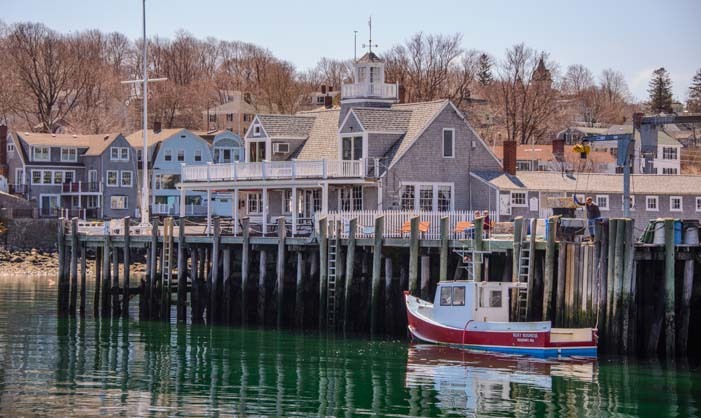 A few days ago, we took a daytrip to the scenic seaside village of Rockport, Massachusetts, a quaint and historic town that oozes charm and has long held a special place in my heart. 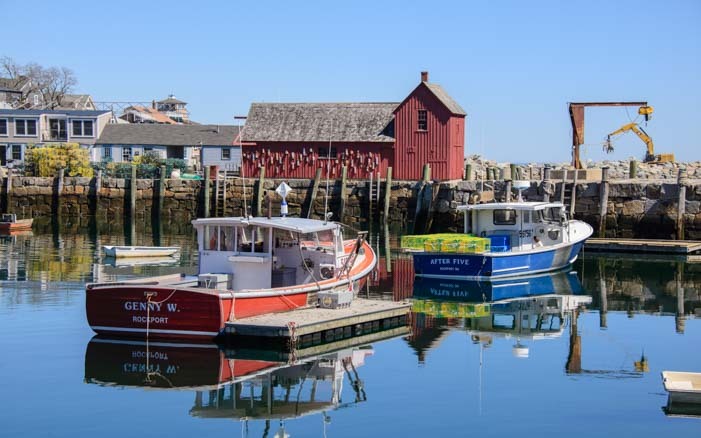 Rockport is just an hour north of Boston, and on any summer weekend it is filled to overflowing with tourists to the point where you practically brush shoulders with fellow walkers as you stroll the town streets. On this visit, however, we somehow magically caught it just right and got there on an ideal 75 degree brilliantly sunny day in mid-April when hardly a soul was in town! 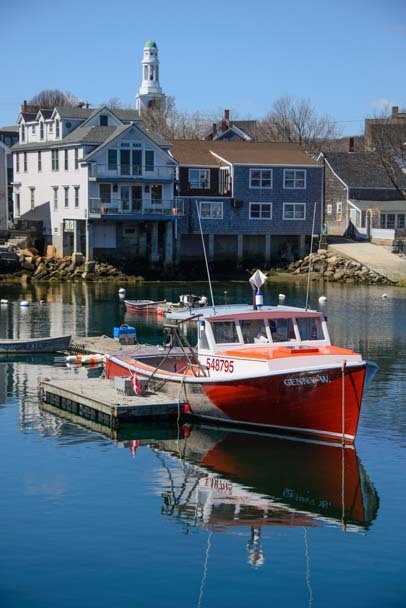 Rockport’s heart and soul is the lobster trade, and there are lobster boats all around the tiny harbor. 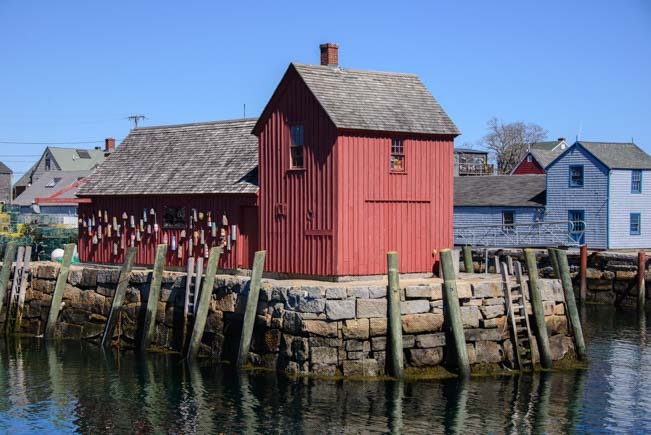 A classic red fishing shack, called Motif #1, presides over the center of the harbor. This iconic building is framed in countless photos and paintings, and ranks as one of the most photographed buildings in New England and the most frequently painted building in America. Motif Number 1 is so well loved that when the original building was destroyed in the infamous Blizzard of 1978, a new exact replica was built in its place! The land on the outer protective edge of the harbor is called “Bearskin Neck,” and it is the site where a man named Babson killed a bear armed only with a knife sometime around the late 1600’s or early 1700’s. 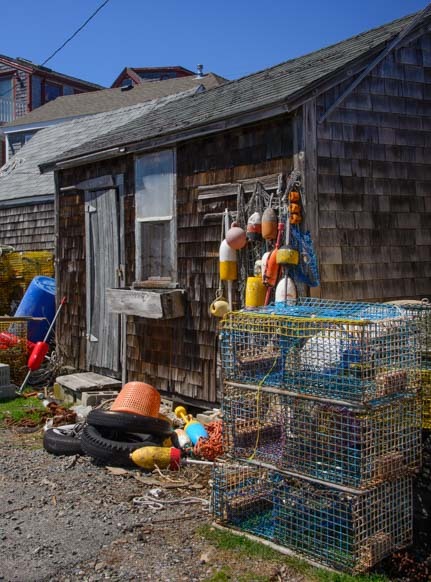 On the back streets of the Neck there are lobster shacks where many generations of lobstermen have done the necessary maintenance on their pots and bouys. Everyday, each lobsterman drops his pots off wherever he thinks the lobsters might be hiding. 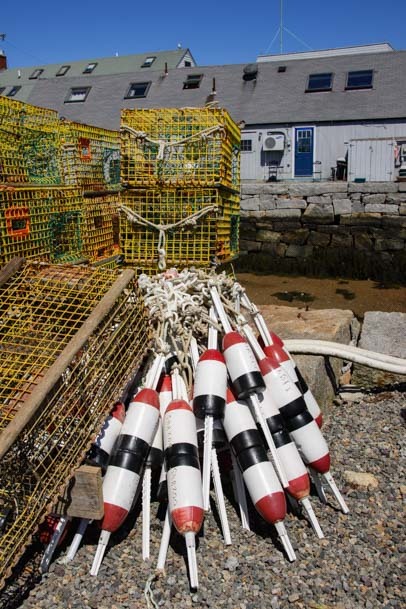 Lobster pots are marked by colorful bouys, and the lobstermen go from trap to trap, hauling each one up to see what he caught. The lobsters that are too small are thrown back and the other critters that wander into the trap are thrown over the side too. 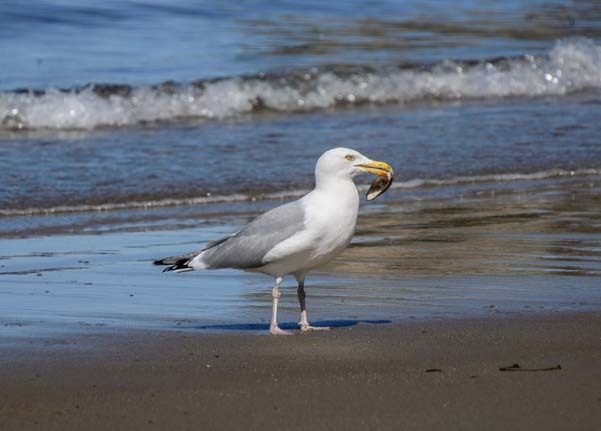 Then he puts fresh yummy bait in the trap and drops it back into the sea. 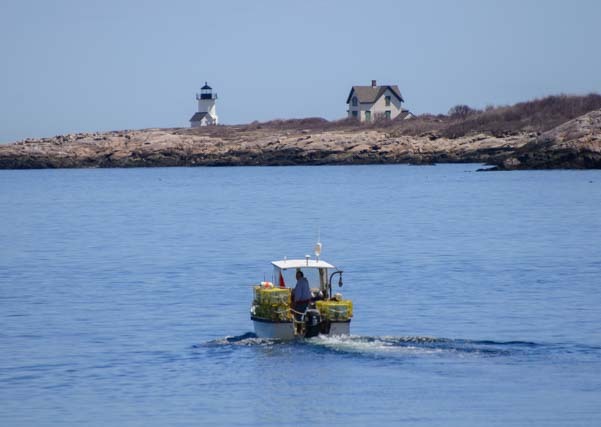 Every lobsterman chooses his own design of colorful stripes and dots and other markings for his bouys to make it is easy to identify not only that there is a lobster pot below but who the trap belongs to. 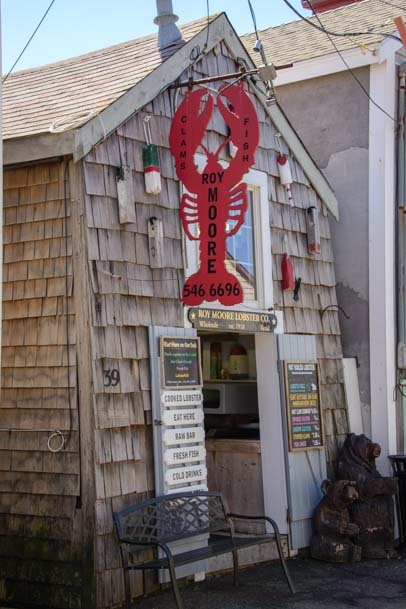 A tiny hole in the wall on Bearskin Neck, called Roy Moore’s, is a great place to see lobsters up close in glass tanks and to get a delicious lobster roll for lunch. A lobster roll consists of chopped up lobster meat mixed with a little mayonnaise and served on a hotdog bun. This may sound funky, but it’s a fantastic way to enjoy lobster without donning a suit of armor, grabbing assorted weaponry and surrounding yourself with dishes of butter melting over flames to grapple with the hard shell and strange anatomy of lobster served whole (bulging eyes, skinny legs, antennae and all) on your dinner plate. 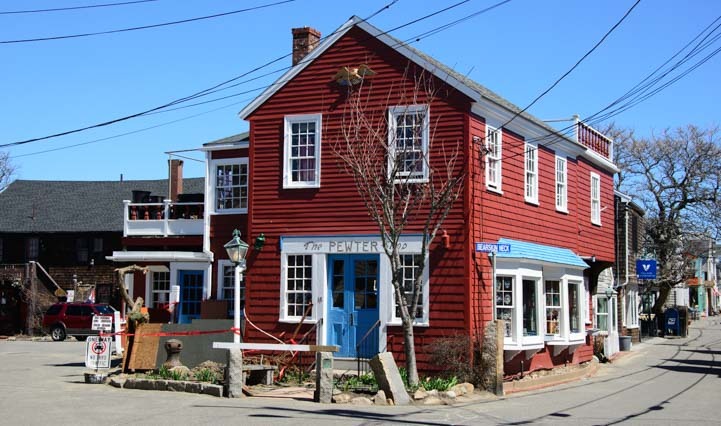 The shops on Bearskin Neck are all small, colorful buildings, and the cute, bright red Pewter Shop has greeted visitors to Bearskin Neck since time began. 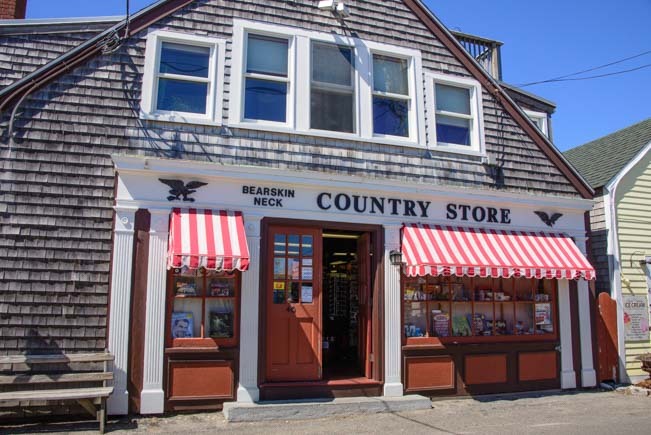 The Country Store is a favorite among kids because of the huge candy selection, and there was a time, a rather long time ago, when the place was lined with glass jars filled with penny candy. Kids would excitedly point at the jars ordering “one of these” and “one of those” from very patient store clerks who filled tiny paper bags with candy behind the counter. Rockport is loaded with history too. Back in 1814 a British frigate showed up, and when the bell in the big, classic Old Sloop Congregational Church in the center of town rang out an alarm, they fired a cannon to silence it. They missed and hit the steeple instead, and a replica of the cannon ball is still lodged there. 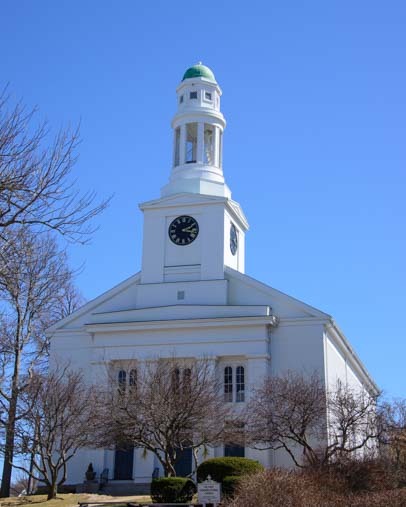 The Old Sloop Congregational Church was struck by British cannon fire in 1814 to silence the bell. 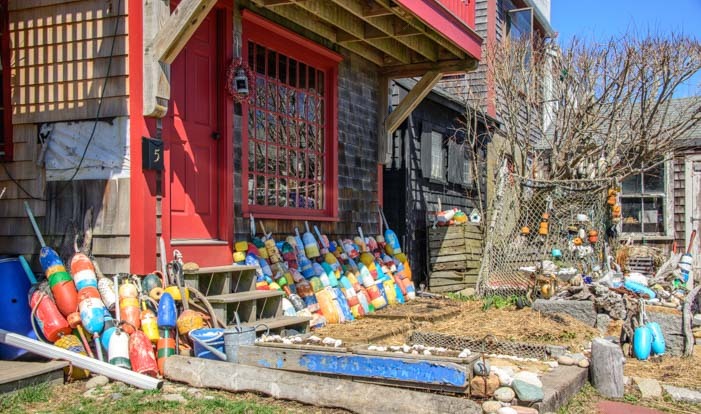 Rockport has been an artists’ colony for years. The Rockport Skyline seen from Front Beach. 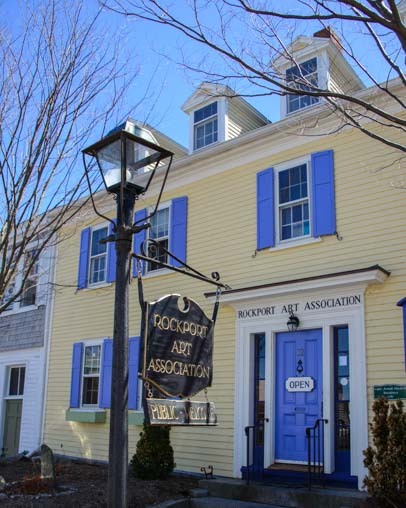 Rockport has also been an artists’ colony for a century, and not only is the town full of art galleries but there is also an active Art Association. For many people, however, it is the beach that makes this town so special, and combing the sand for pretty lady slipper seashells and well worn beach glass is a soothing way to pass a few hours. 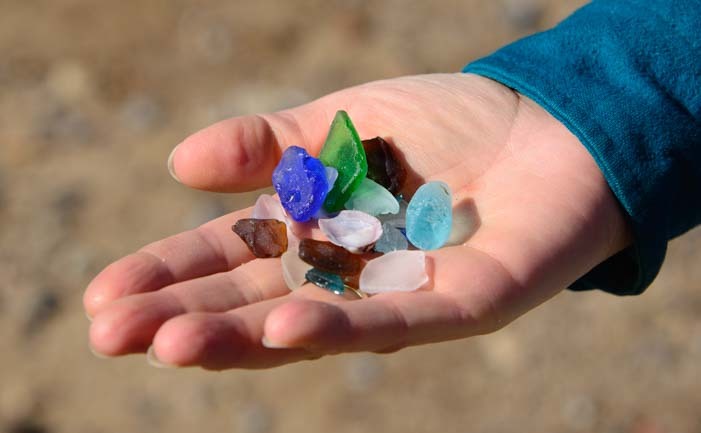 We were amazed that a mere ten minute stroll on Front Beach turned up a treasure trove of beach glass! Beach glass gathered in 10 minutes of casual walking. In town we found an artist who is using the local beach glass to make jewelry. What a creative idea! 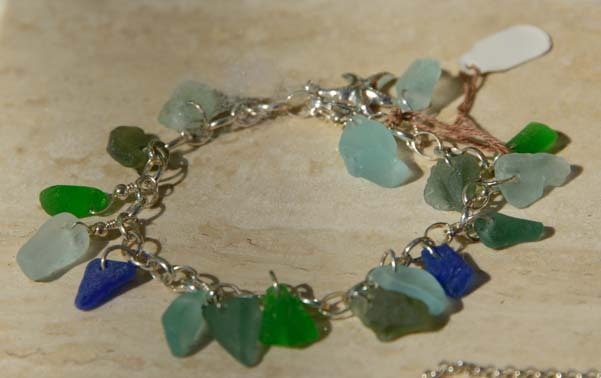 A creative jeweler in town is making jewelry from the local beach glass. How clever! Without doubt, the cries of seagulls — punctuated by the hourly chimes of the Old Sloop Church bell — are the song of Rockport. This guy’s mouth is full, so he’s quiet for the moment! Another kind of music comes from the Shalin Liu Performance Center that now dominates the Rockport skyline behind Front Beach. Once a grocery store and later a dress shop, this fabulous building has been expanded and renovated to offer enormous views of Sandy Bay from its back side. 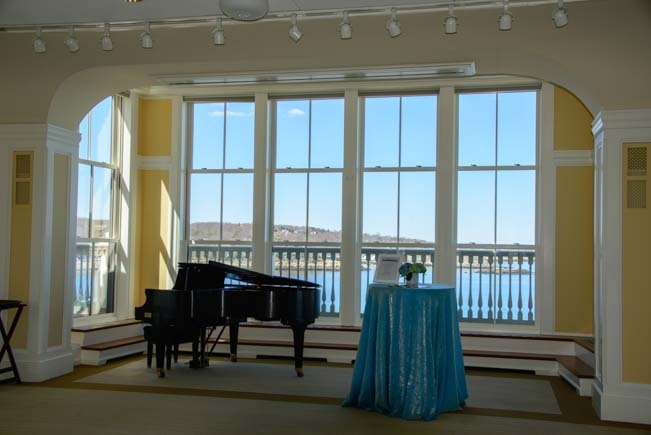 The Reception Hall on the top floor has a lovely view. Evening concerts are often accompanied by a visual feast of waterfront sunsets. 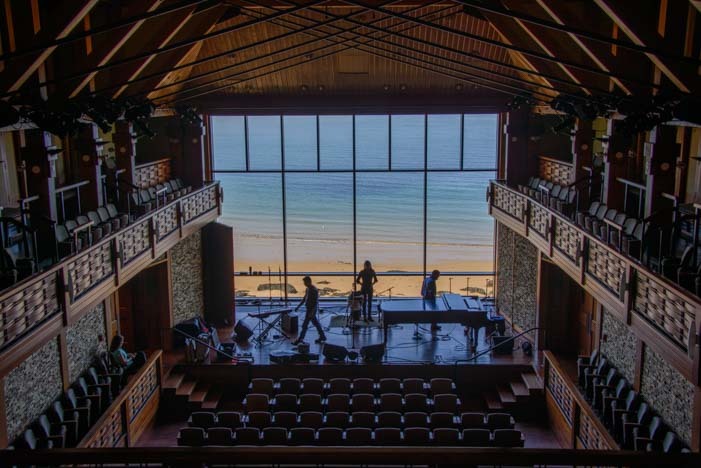 A wedding reception in the upstairs Reception Hall would be nice, but a chamber music concert while watching the sun setting on the beach behind the stage must be truly out of this world. All kinds of groups and musicians perform at the Shalin Liu, but we were advised that if it is a loud, amplified band, they may have to close the curtains behind the stage because the sound reverberates off the glass windows. So if you go, keep that in mind!! We had a picture perfect day in Rockport. 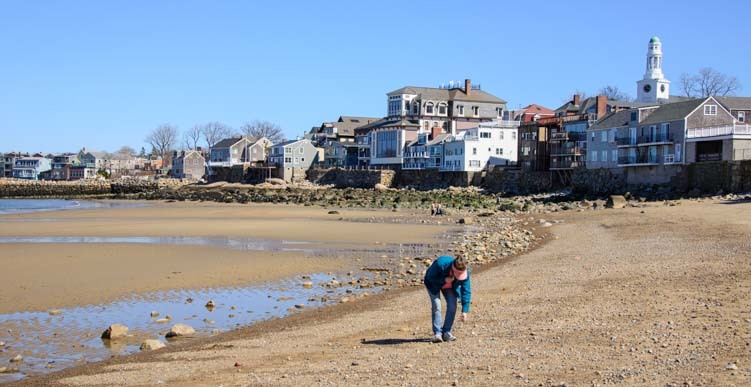 If you take your RV anywhere near Boston’s North Shore, a trip to Rockport is a must. Midweek or off-season, it is a truly delightful excursion! This entry was posted in Quick Pics and tagged Massachusetts, Quick Pics, Small Towns by Roads Less Traveled. Bookmark the permalink. Emily, as usual, your photographs are outstanding. I have never been to this little pocket of our country, but your pictures make me want to put this destination on my ever growing list. Thank you for the post! Thank you, Dennis. This is one photogenic little town, and with the perfect day and still water in the morning, it was just a matter of “point and click” to get lovely shots! Enjoy your visit if and when you get there! !